For my family, Spring Break includes a longtime tradition of fishing for trout in lakes and reservoirs throughout Oregon and Northern California. The tradition goes back several generations. When my father was growing up, my grandfather would take him to different trout lakes each April to fill the creel with stocked rainbows. I spent each March, April and May as a kid fishing trout lakes and streams with my father and grandfather. And now, more than 30 years after I reeled in those planted rainbows while in elementary and middle school, I take my daughter to different trout waters each spring so she can experience that “tug-tug-tug” bite and often fast action that accompanies fishing for hatchery rainbows. Working as a full-time guide, my family gets plenty of opportunities to fish. But when it comes to stocked rainbows, we have to hit the road. 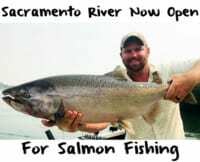 The Southern Oregon coastal town of Brookings, where we live, has plenty of world-class fishing, mainly for salmon, steelhead and ocean fish, but there are no trout lakes in out community. We have to travel at least 50 miles to Lake Selmac near Cave Junction, or Arizona Beach Pond near Port Orford, to catch trout. So each Spring Break, as an excuse to hit the road and explore new country, we load the trout rods in the back of the truck, and travel to another part of Oregon to soak baits for planted rainbows while enjoying the other sights and attractions unique to areas of the state. The North Coast, near Newport, Tillamook and Astoria are favorite destinations. So are the large reservoirs at the headwaters of the Rogue and Applegate rivers. And we’ve logged hundreds of miles driving to the Willamette Valley to fish and enjoy the week away from school and work. We start our vacation by checking out the trout stocking schedules and deciding where to go. In Oregon, finding where to fish for trout is easy. The Oregon Department of Fish and Wildlife has done much of the homework for you. Visit http://www.dfw.state.or.us/resources/fishing/trout_stocking_schedules/ for complete stocking schedules and maps of lakes with trout. My family has discovered many new favorite fishing locations by looking at the map showing which lakes are stocked, and hitting the road to see new water. We like to fish the week after the lakes are stocked. There are easily more than 100 waters stocked throughout the spring in Oregon. 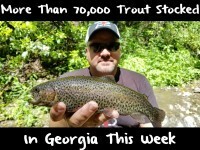 Most waters with hatchery trout have easy access and bank fishing. For Spring Break, we leave the boats at home, and hoof it when it comes to trout fishing. The whole key to trout fishing is getting your bait in front of the fish. Each trip, we see people make the same common mistakes. They fling a half night crawler out, but don’t float it off the bottom. The bait quickly sinks to the bottom and is hidden by the weeds. 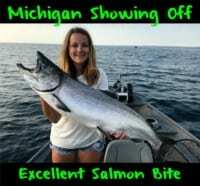 They don’t even get a bite, while little kids floating dough baits, or suspending salmon eggs or worms below a bobber are catching them right and left. We like to fish with salmon eggs. The bites are aggressive and the kids have an easy time putting the eggs on the hook. Pautzke’s Green Label Balls O Fire are out go-to bait. Since salmon eggs naturally sink, we either fish them below a bobber, ideally 2 or 3 feet above the bottom, or float them with the help of a small marshmallow. Younger kids are usually more willing to handle salmon eggs and marshmallows than live night crawlers. The typical rig is a 30 inch leader of 4-pound-test mono with a size 8, 10 or 12 gold Eagle Claw egg hook. Remember, trout have small mouths and the small hook is easier to float up with a marshmallow or dough bait. A small barrel swivel is used to connect the mainline and leader, and then a couple of small split shot are added directly to the mainline just above the swivel. If using a bobber, it is placed several feet above the swivel. Remember, it is important to float the salmon eggs not only off the bottom, but above the weeds, which generally rise a couple of feet above the bottom. If using dough baits, like Pautzke’s deadly effective Fire Bait, a small treble hook will often hold the bait better than a small egg hook. Use just enough bait to float the treble hook, but no more. Too big of a bait and the trout will peck away at it without getting hooked. Too small and the hook will sink it to the bottom. You want the bait about two feet off the bottom. A ball of Fire Bait between the size of a thumbnail and fingernail generally is the best size. Stocked trout often draw a crowd. To give yourself an edge when there are other anglers around, try adding scents to your bait. A squirt of Pautzke Nectar or Liquid Krill to your dough bait or salmon eggs just before casting will add just enough scent to get the attention of rainbows and other trout and get them to notice your bait instead of others. It is true the scent quickly washes off, but that initial burst of smell is usually all that is needed. Editor’s Note: Author Andy Martin is a full-time Oregon, California and Alaska fishing guide and charter boat captain. His Web site is www.wildriversfishing.com.